Freddie started a FF in H&L 14 when they were on 125th Street. He worked as a Lieutenant in the South Bronx’s Engine 41. Expanding his experience level, he served as Captain in the heart of Midtown Manhattan, H&L 2. EVERYONE who ever worked with Freddie, loved and continues to love him. Always a smile. Always encouraging. Always a good word. B.C. 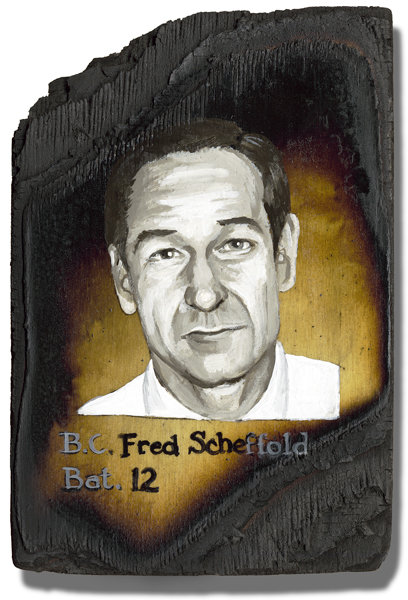 Fred Scheffold was my great Uncle, my grandfathers brother. He was the funny one always smiling and always happy. He was a good father and husband to his wife and children. He was an amazing Uncle to the rest of us. Family meant everything to him. He worked for a brotherhood on FDNY and proud to have served. In the month of August 2001, my family lost my grand father, Freds brother…the entire family got together to remember him. Everyone joked around laughing but the mortality of life lingered in the room. Fred was asked when he planned on retiring from the FDNY…Fred the every gentleman he was laughed and said the words I will never forget ” Retire, ha I will die doing this job”. and those are the words I still hear 15 years later…you see one month later 9/11 happened and we lost Fred. Fred and his unit were coming off shift when the first plan hit the trade center. Instead of leaving and going home his unit stayed on the job and went to help people. Because helping people is what they do. God bless the FDNY…to my great uncle Freddy, you are loved and will forever be a hero in my heart.